Who says a girl can't DIY shelves and make an old filing cabinet so much better? Who says a girl can't DIY shelves and make an old filing cabinet so much better? 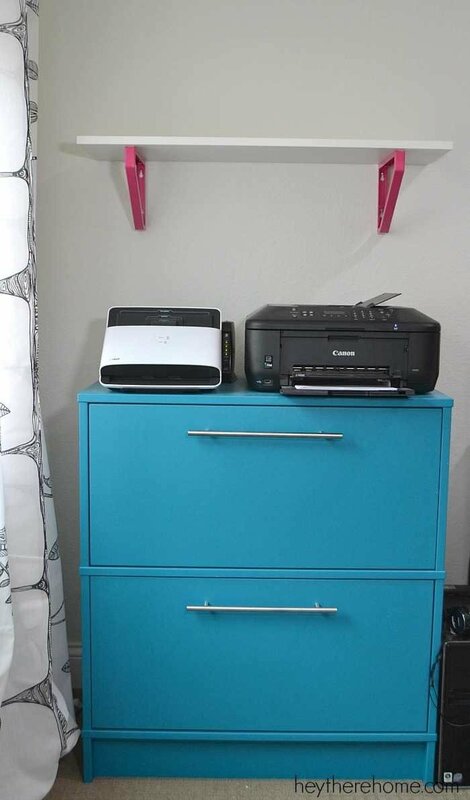 Who says a girl can’t DIY shelves and make an old filing cabinet so much better? So you know the other week when I hinted at some major girl power progress when it comes to doing projects myself over on Instagram? Well you guys, I completed my first official built-all-by-myself piece of furniture, power tools and all! 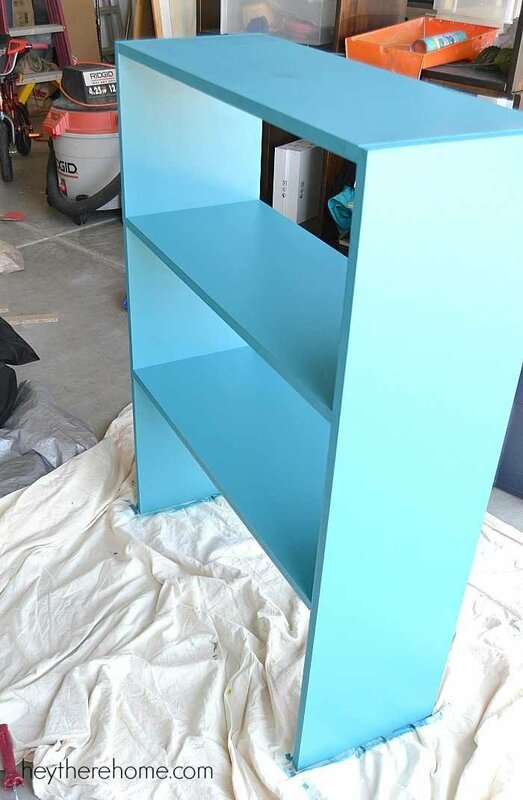 I had been day dreaming about how I could take our old Ikea filing cabinet and turn it into a full fledged storage unit for our office and the reality is that my husband, who usually helps me with bigger projects like this, has been so incredibly busy and I was getting impatient. I am no newbie when it comes to DIY and I’ve used power tools before, but for some reason I was a bit of a fraidy cat when it came to being all by myself when using them. Not anymore. I think I may have just unleashed a serious power tool addiction. I mean, look how great my new and improved filing cabinet looks! It’s like it was meant to have the upper shelves there all along. Definitely a huge improvement in terms of storage in the office. I’ve been working hard to turn our office into a super efficient and creativity inducing space and if it were all mine it would be easy to do, but my husband and I share this space and well, the guy has a lot of paperwork! The original plan was to have him use the two file drawers but what I didn’t realize was that he has a lot of reference books and binders that he also needs access to, so one simple shelf above the file drawers wasn’t going to cut it. So I got to thinking about how we could take our existing filing cabinet and make our own shelves that would attach to it to create one big wall unit. And I wasn’t about to wait any longer for J to have some free time to help me so I did a little research and remembered this awesome tool that I saw demonstrated at a conference a couple of years ago that allows you to make super straight cuts without a table saw -something I don’t own. 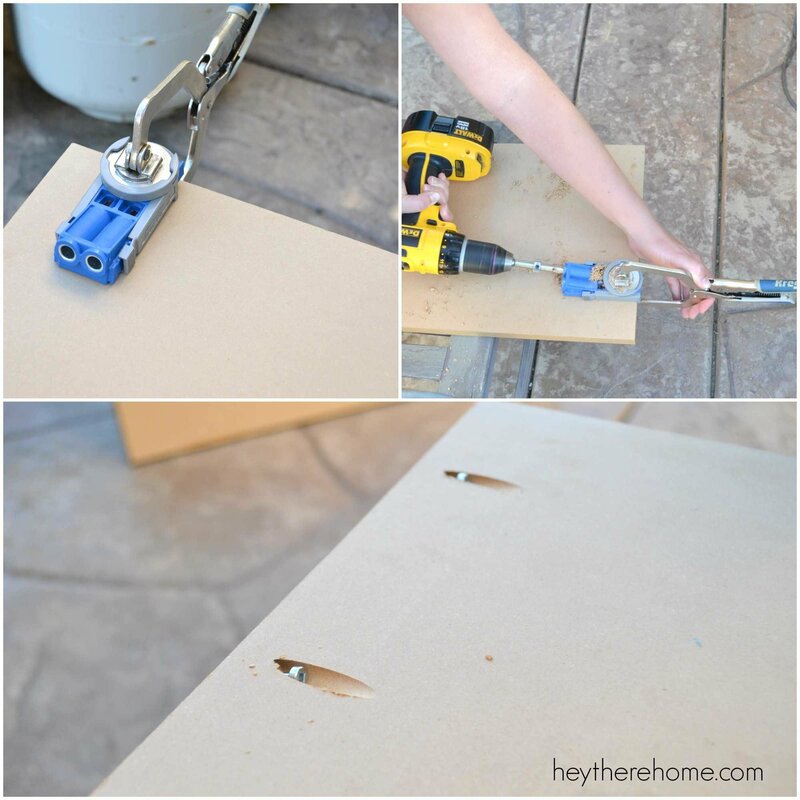 It’s called the Kreg Jig Rip Cut and it attaches right to your circular saw. You set the width and literally slide the guide along the edge and it makes one straight cut after another. Took all of the guesswork out of making my cuts. Before cutting my boards, I thought about what I wanted to put on the shelves and planned out my dimensions on paper. The total width of my shelves was determined by the width of the existing filing cabinet since I was going to attach it to the top. 2 side boards: The height will be the height of each board + the thickness of each shelf. A board for each shelf and the top: The width of your final shelf – the thickness of the side pieces. To attach the pieces of my shelf I used a kreg jig to drill holes. It is awesome because it creates angled holes which make for much stronger joints. It’s just a matter of clamping on the guide and predrilling to the set depth. Then the final step is to line up the two pieces you want to join and drilling in the screw. I used a left over piece of underlayment from our bathroom remodel and cut it to fit the back of the shelves. 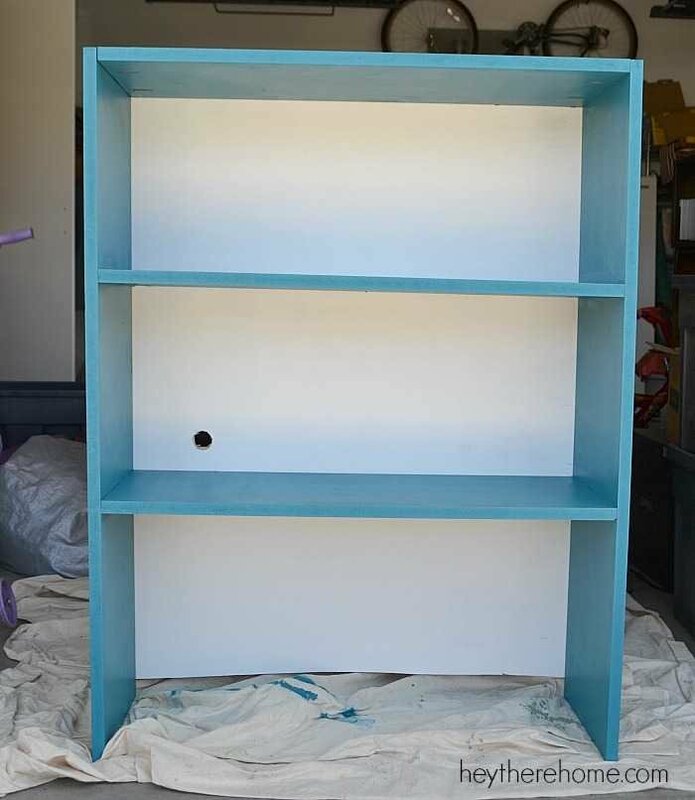 I painted it white and cut a small hole for cords before attaching it to the back of the shelves with small nails. You can see that I cut the backing a bit short so that I could feed cords through the back of the bottom shelf. The best part about making your own DIY shelves is that you get to make them work exactly the way you want them to. 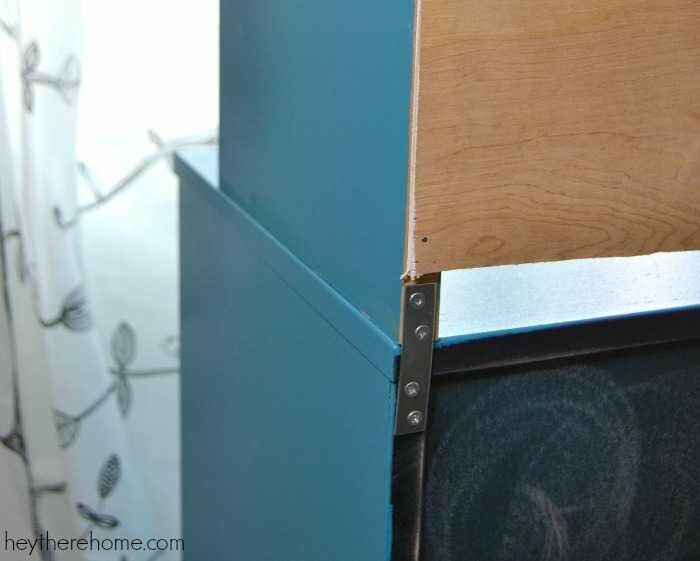 Adding a back will make your diy shelves a lot stronger, but before you attaching the back, double check to be sure your shelves are perfectly square. Once it was built, we set it on top of the filing cabinet and attached it using flat brackets in the back and L brackets in the front. 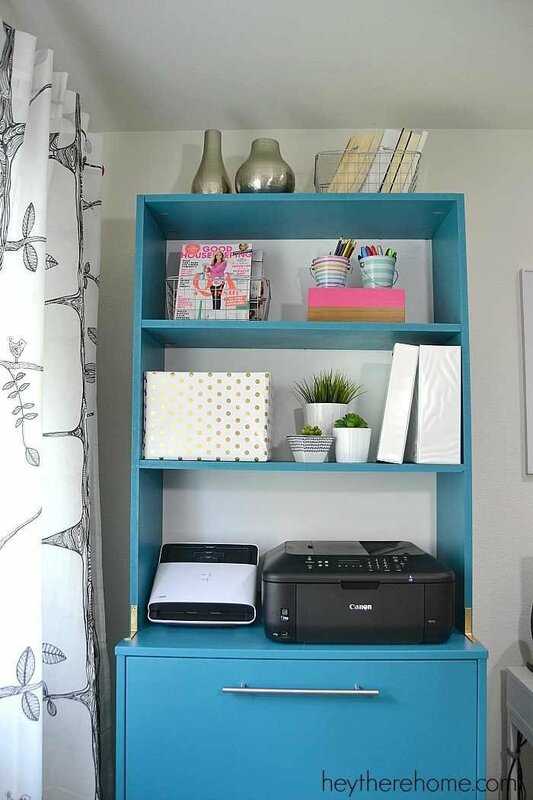 I love how having this large piece of fun colored furniture really grounds this side of the room and is the perfect place to store all of the things we need in the office plus the backing on the shelf hides a lot of the cords to keep it looking sleek. Now it’s just a matter of getting the rest of our papers and random stuff organized and coming up with a good system to keep the mail under control and this office redo will be a wrap! Getting so close! 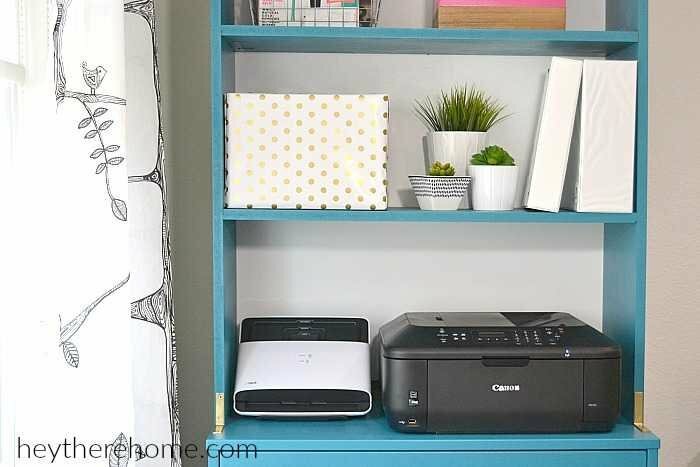 Wall art in 10 minutes with no holes in the wall! 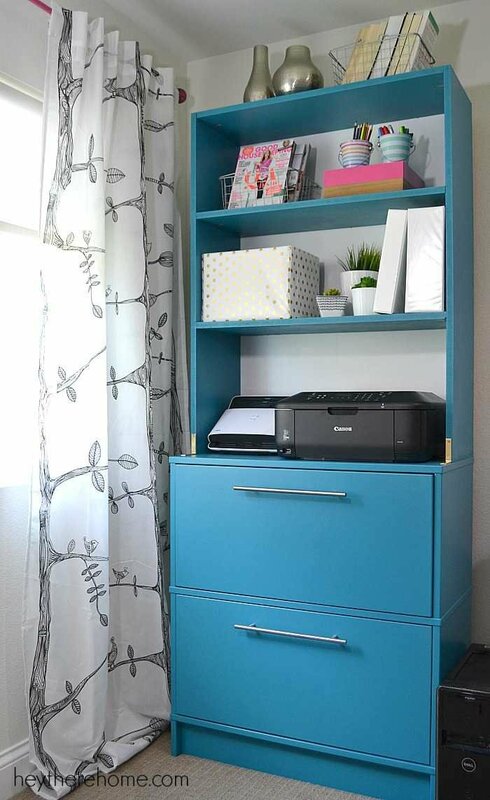 I love this and have actually been looking for something like this or how I can create something like this where did you get the file cabinet? Hey Ryan! The file cabinet is from IKEA but I made some changes. I used IKEA’s kitchen cabinet pulls and painted the cabinet as well. It was a dark brown veneer so I did just a really light sanding before painting. The color is Briny by Sherwin Williams and I used a small sponge roller to apply it. Hope that helps! Wow, so impressive! Looks great! I feel the same about so many projects I’ve got on my list for hubby to assist with… “why can’t I just do this…or that… myself?” Very inspiring article. Thanks so much Charlotte. I say go for it! I’ve decided that I’m going to start learning and trying more things on my own. It is really fun and so rewarding and there are so many amazing tutorials and videos out there for people like us! Woo hoo!! Go girl!! This is awesome! Corey, you are so talented. Thank you for showing us the step by step progress. 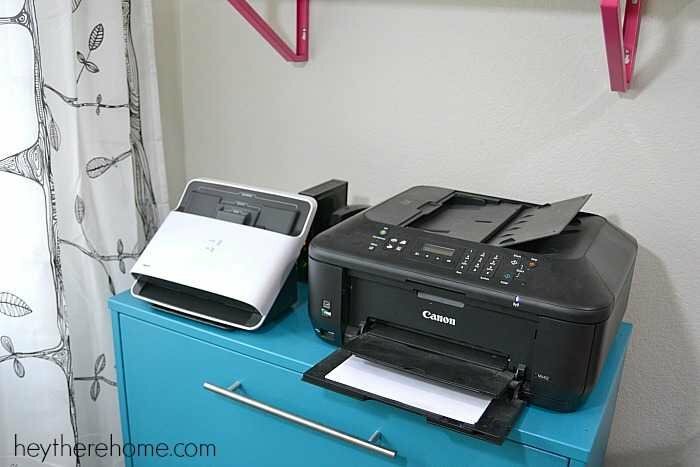 Now when I look at my open shelves above my printer I think, “How tacky.” I would not be afraid to tackle something like that now because you also tell how to measure the shelves. My whole living room has been redone thanks to you. Hey Barbara! Thank you so much. It’s all about learning as I go I guess, but the reward is always worth it! I noticed that you made a joke in the back panel and there is a box in front, what do you have concealed in the gold dot box? In thinking modem? Yep! I’ll be posting about that soon. Such an easy trick to hide the ugly stuff! Fantastic job – good for you taking it on!! Where did you find those cute curtains?! Hey Alicia! They are from Ikea 🙂 Super affordable and so simple!